Cool! Tickets For The Who's Canceled '79 Show Good For 2013 Concert : The Two-Way After a stampede at a 1979 show in Ohio, the mayor of Providence said the band couldn't play in his city. But The Who will be there next February, and 10 fans who still had their old tickets won't be disappointed again. 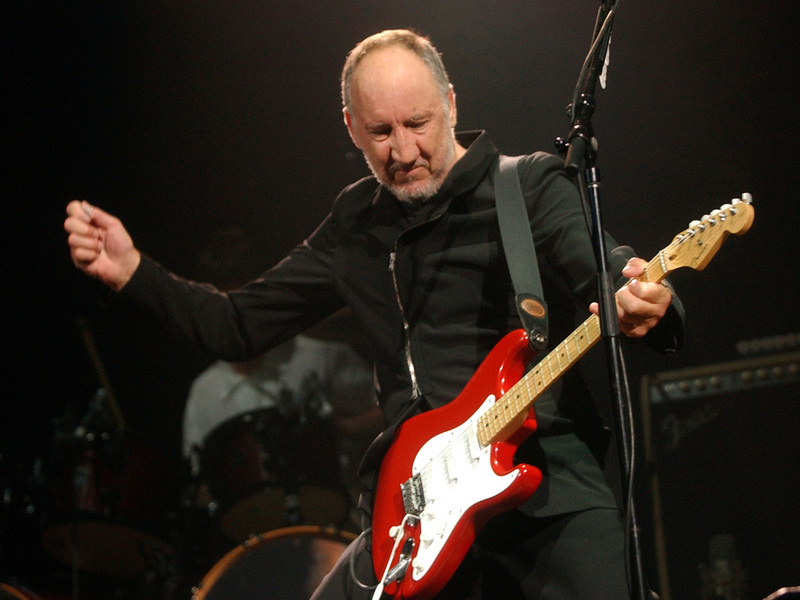 Pete Townshend of The Who. Fans in Providence have waited 33 years to see him. In 1979, after 11 people died in a stampede before a concert by The Who in Cincinnati, the band's show scheduled for two weeks later in Providence, R.I., was canceled by then-Mayor Buddy Cianci. He didn't think it would be safe to have the band play in his city. And The Who hasn't been there since. Next Feb. 26, though, The Who is coming to town and Dunkin Donuts Center general manager Lawrence Lepore said that if fans still had their tickets from the '79 show they could exchange them for seats at the 2013 concert. Tuesday, as the Providence Journal reports, "the patience and tenacity of 10 Who fans was rewarded ... at the Dunkin' Donuts Center, where they traded in 14 tickets to the band's canceled 1979 Providence performance in exchange for tickets to their February 2013 show at the Dunk." The ProJo has video. Fan Ed McConnell says he knew exactly where his two '79 tickets were: one was in a cigar box in a closet and the other one "was stuck on a cork bulletin board in my parent's house in my brother's old bedroom." The '79 tickets cost $10.95, with a 55-cent surcharge tacked on. McConnell tells the ProJo that the seats he's gotten for next February's show go for $129.50 and are "much better seats" that he had for the canceled show. The band Providence fans will see, of course, has changed. In 1979, Kenney Jones was the drummer (Keith Moon died in 1978). Zak Starkey — Ringo Starr's son — now drums for the band. Bassist John Entwistle died in 2002. Pino Palladino now plays bass. Guitarist Pete Townshend and singer Roger Daltrey, though, carry on. This blogger's wife still has the intact Woodstock ticket (the 1969 Woodstock!) that she didn't get to use. Anyone else out there have something similar?